Companies in Asia have a major diversity problem. Compared to their western counterparts, shockingly few women hold leadership positions in these organizations. The problem is most acute at the very top of the corporate ladder, where in many cases, women are nowhere to be found. 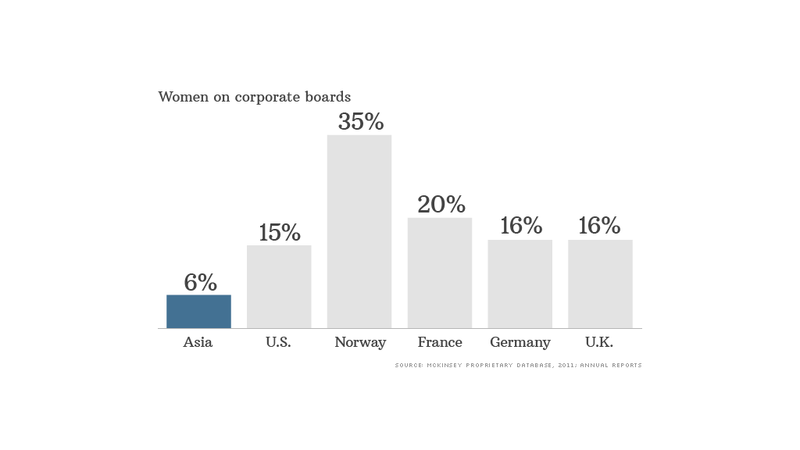 Women occupied only 6% of corporate board seats in Asia in 2011, according to a study conducted by McKinsey. That puts the region well behind Europe and the United States, where 17% and 15% of board seats are held by women. In South Korea, only around 1% of company board members are women. The figure is 2% in Japan, 5% in India, 6% in Indonesia and 7% in Singapore. Even in Hong Kong -- Asia's finance capital and one of the most progressive cities in the region -- data compiled by transparency advocate David Webb shows that 40% of companies have no women on the board. 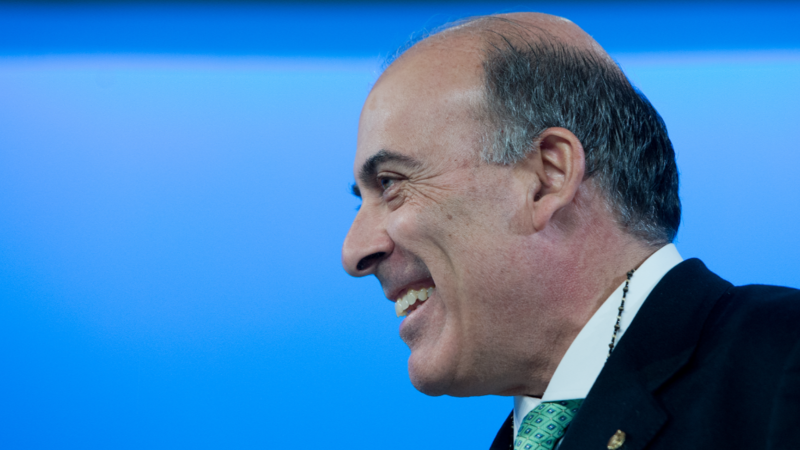 Another 38% of boards have only one female representative. "Where we are today is so woefully inadequate," said Su-Mei Thompson, CEO of The Women's Foundation. "The statistics show the pace of change is too slow." The argument for more women on corporate boards -- aside from basic issues of equality -- is that companies make better decisions when a variety of views are considered. There is even some evidence to suggest that firms with diverse boards outperform their more homogenous rivals. There are a few bright spots in Asia -- Australia, for one. But overall, women in Asia are underrepresented regardless of their home country's wealth or development level. The disparity is even more alarming given that half of Asia's college graduates are female. Part of the gap can be attributed to cultural factors, which contribute to Asia's relatively low rate of female participation in the workforce. In countries like India, women have significantly lower literacy rates and reduced access to education. In other parts of the region, women face outright sexism and an entrenched old boys' club. Japan's female employment rate is currently around 60%, far below the 80% rate for men. Women in Asia also encounter pressure at home -- and large numbers of educated women exit the workforce after having children. The end result is fewer qualified women in company ranks. The McKinsey report suggests that corporations deserve some blame for not making the issue a priority. According to a survey conducted by the group, 70% of executives in Asia said greater gender diversity was not a strategic imperative. "If companies want to see more women in their leadership teams, they will have to address the cultural and organizational issues that prevent them moving through the corporate pipeline," the McKinsey researchers wrote. Related story: Why are there still so few women in top leadership jobs? Some progress is being made. The Hong Kong Stock Exchange, for example, has introduced a rule that requires listed companies to report on their board diversity. While it does not mandate more women on boards, Thompson said it will force companies to consider the issue in a more serious way. "We would hope that companies would not just pay lip service to this requirement, and actually really examine the makeup of their boards," she said. For now, there is little chance of rules requiring more diversity -- a strategy tried elsewhere with some success. Norway, for example, enacted a law in 2003 that forced companies to appoint women to 40% of board posts. After some grumbling, firms complied, and today the country's boardrooms are the most diverse in the world.